andreaska added a comment to T10165: Category icons should all be colorful. andreaska accepted D15931: [Places panel] use more appropriate network icon. andreaska added a comment to M132: Plasma Mobile Clock. andreaska added a comment to M129: Plasma mobile weather app. andreaska added a comment to D15323: Hide printer applet if no printer is configured. 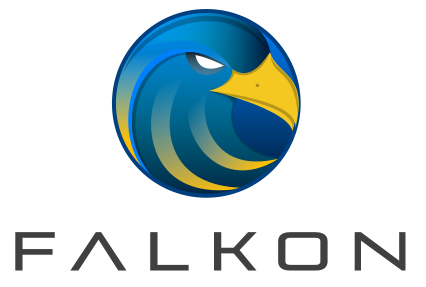 andreaska added a comment to T6859: Falkon - VDG feedback. andreaska added a comment to D14326: Fix layout of resolution selection. The thing is that you should bring more focus to the screen factor setting. Ordinary you should not change the screen resolution you should change the factor on hidpi this should be in focus. Nobody should change the resolution and the rate by default cause best result will always automatic setting. Thats the reason thomas prefer the drop down from ux perspective when i say use the slider. andreaska added a comment to D14325: Remove Advanced section from screen config. Will be useful. Can you make the dropdown items all the same size. andreaska accepted D14218: Introduce a test to make sure we're not offering duplicated icons. andreaska added a comment to D14123: Add `drive-optical` icon. andreaska added a comment to T8753: Launcher Menus Convergence. Dashboard didn't show recent files only when you search you get recent file and apps listed. As pc doesn't mean only open a app I would like to see some improvements in file and folder handle. Why plasma can't show me what I did recently so I can start the work again. That's something I also had in mind but how should this section be called? andreaska added a comment to D13006: Move the inline installer progress cancel button to the left side. andreaska added a comment to T8755: Allow user to change Breeze accent. andreaska accepted D12835: Draw borders around side panels by default. andreaska accepted D12677: Ported page about icons from wiki to rst. andreaska added a comment to D10494: update handle- icons for kirigami. andreaska accepted D11137: overflow-menu as view-more-symbolic, and horizontal. andreaska added a comment to T7662: Online Playlists. andreaska added a comment to T8261: Visual image for VVAVE. andreaska added a comment to T7878: Create or find Icon. Cuttlefish? How can I help? andreaska added a comment to D10297: Add new "Tools" button above System Monitor's process list. Where do you need an icon? The two examples didnt work cause you mix different stuff in one non saying drop down button this doesnt work. andreaska accepted D10212: New virtualbox icon. andreaska accepted D10211: Suggestion for emacs icon. Cool should look good in the panel with the lighter background. andreaska accepted D9976: Display version alongside source, and use a combobox to switch between them. andreaska accepted D9974: Improve header and metadata display. andreaska added a comment to D9847: replace default background for HeaderBar by a wallpaper from Breeze. Can you use the user wallpaper? Than you dont need to add an wallpaper and have to care. andreaska added a comment to D9816: Ensure DesktopIcon paints with the correct aspect ratio. andreaska accepted D9815: [KFileItem] Use "emblem-shared" for shared files. andreaska accepted D9596: tune appearance of all albums and all artists views. andreaska added a comment to T6831: Top-notch usability and productivity for basic software. Firefox and other software ask you after your account. Would be nice to have one single account (secret service) somewhere (your cloud, hard disk, ...) where everything is stored and one login would be the universal key. Kde vaults by default where all setting dictionaries will be stored. andreaska added a comment to T7185: Icon for kio-stash action. folder-stash is the icon called submitted to master. please change dolphin icon name. andreaska added a comment to T7189: Search results should be organized in folders. what do you prefer? give me a filename for the icon please. andreaska added a comment to D7520: Fix icon of KStandardAction::MoveToTrash. andreaska added a comment to D7446: [Places panel] Revamp the Recently Saved section. andreaska added a comment to T6868: Icons for advanced trimming tools..
andreaska accepted D8034: add overflow-menu icon. andreaska added a comment to D7440: Turn on Dolphin icon previews by default. update the previewer (speed) is always a good idea. I always didn't understand that there is an preview icon in the main toolbar but by default all previews are turned off via the settings so after a fresh installation open dolphin click on preview you didn't get a preview. that's strange, because when the user want to see the file preview the user should get it. In addition some modules aren't in the default installation (e.g. video and pdf) so you get first not what you want (no preview when click on preview) and second when you are in the settings you see that there isn't a preview for videos and pdf available. if someone need help with the color scheme styling I can help. andreaska added a comment to T6854: Modernizing Kontact look. I would have this 3 buttons instead of bottom left (additional toolbar) to the top toolbar (as there is already an toolbar for the apps). as less different UI elements as possible. In addition you don't have that much actions in the main top toolbar in a PIM suite. so when you are interested into some facelift, ping the VDG. As you saw in the two quick mockups it's not another application is't kontact you have there the folder view OR a panel view so simple and advanced and you have the conversation view which you already show on your screenshot only without show the header for each conversation mail. 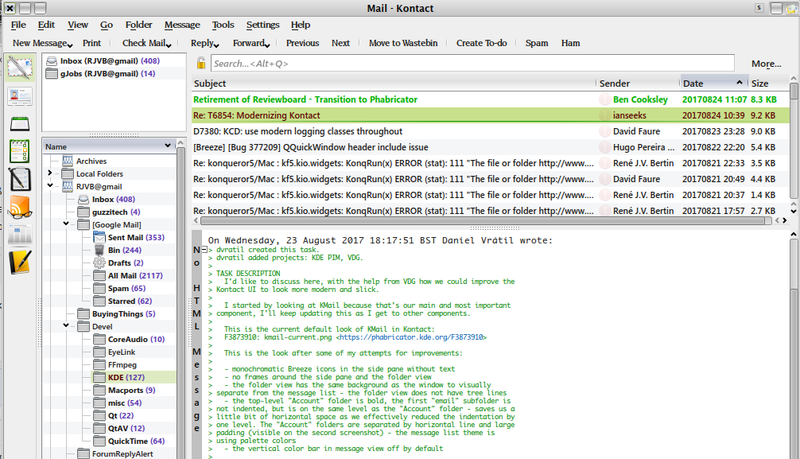 the e-mail view (detail view) if fine for me maybe you can add an inline delte, reply, forward, ... action than you can remove the toolbar. and the conversation view for the mail section. For the sidebar with the mail folders I have something in mind like places and folders widget in dolphin. andreaska updated subscribers of T6854: Modernizing Kontact look. oh and sorry but I don't think the updates (screenshots) are an improvement, sorry. Hi @dvratil awesome to make some design stuff here. andreaska added a comment to T6267: New systemsettings UI. I would focus instead of the SubSections at the single KCM. If you select first the main group and than show all KCM's the KCM's aren't that hidden as in the old layout. As you can see in the screenshot there are 10 - 15 KCM's per Main Section. andreaska closed T6720: system setting sidebar view as Invalid. andreaska created T6720: system setting sidebar view. andreaska added a comment to T6545: Splash and Welcome screen. About the links. I like them. Why you dont have a donate section on the webpage? Something like a tutorial page where you link at the start screen would be nice. However. Donate should be there or support where you have a website like libreoffice https://donate.libreoffice.org/ support via money or time. Last mockup is really good. I would use white for recent but for show on startup gray. andreaska added a comment to T812: Add image preview to effects. Kube removes the preview, because it's useless to have a random color and a useless first letter. Group them would be a better way. Maybe have a gif preview of a transition or an icon like PowerPoint did it. I made some icons for libreoffice impress transitions and can support if needed. Hide after startup like in krita is shorter. Maybe checkbox hide would be enough. Translations are most of the time longer than english. Can you check how it would look like you have recent, new and open in one line. And on bottom the links like in the right pictures. andreaska added a comment to F3816173: welcome-screen-1.png. Look really good. Maybe when you move recent and links as header in the gray area and in the black rectangle only the files and links. andreaska added a comment to D4960: Pause media players on suspend. andreaska added a comment to D5424: [Notifications] Introduce "settings" action. andreaska added a comment to M90: Sensible icons for Plasma Activities (action icon). andreaska added a comment to T2782: Outbox. are still available in breeze, oxygen and most other icon themes. @mbohlender got the ping but didn't found the time, sorry. where (and in which size) the icon will be used? when you need some new breeze icons, please ping me or fill a bug report. andreaska added a comment to D4560: Increase smooth scrolling animation duration from 100 to 300 ms and set easing curve to InOutQuart. I can't give you any feedback, sorry that I can't help, but I don't know how to review it and how to help. andreaska added a comment to D4917: [Breeze Plasma Theme] Improve action-overlay icons. only a draft based on the old design with the new semantic. andreaska accepted D4649: add a preview for the disk quota plasmoid. andreaska added a comment to D3684: Media Controls on lock screen. andreaska accepted D4626: Renamed icons for encrypted and decripted folders. good point. If you want to use this icons I'll make them for the other places size. andreaska added a comment to D4495: Remove monochrome application icons. when was the last release for ktorrent? please have a look at applications like amarok or ktorrent some icons are needed for this applications. andreaska added a comment to D4400: Plasma 5.10 "Cascade" Wallpaper. ken never stop make wallpapers. ken please upload your old wallpapers to the kde store. andreaska added a comment to D4253: redesign gwenview icon. Varlesh you do awesome icon work, but gwenview was changed some time ago so no icon redesign needed sorry. Please work on other icons. andreaska added a comment to D4298: [Color Picker] Add contrast frame around colors in popup. andreaska accepted D4278: fix icons bittorrent-sync, codeblocks, darktable, ffmulticonverter. andreaska added a comment to D4278: fix icons bittorrent-sync, codeblocks, darktable, ffmulticonverter. andreaska added a comment to D4289: Add VLC tray icon. can you upload the svgz file cause I can't download it here. andreaska accepted D4264: redesign android-file-transfer icon. andreaska added a comment to D4258: redesign gimp icon. How does it look without pencil? andreaska added a comment to D4262: redesign android-studio icon. oh schit didn't no this. thanks but I thought only the circle is in the icon now nearly the full height and in your design only 2/3 of the icon height.